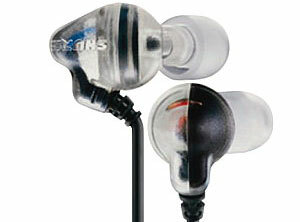 Will these pro-looking earphones deliver? 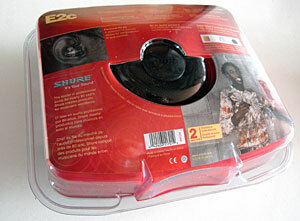 Seduced by positive reviews, tempting Internet prices and the company's reputation for supplying top notch gear to the music industry, we recently invested in a pair of Shure's E2c 'sound isolating' headphones. 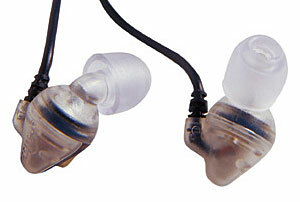 As well as creating industry standard microphones like the SM57 and SM58, Shure have been making a splash with their in-ear headphones for professional musicians, and the E2c sees the technology filtering down to mere mortals. Before we get on with the review, we first have to comment on the amount of packaging that accompanied the headphones. It was outrageously wasteful. Coming packed in those stupid, irritating, sealed transparent tough plastic bubbles that require the strength of Warrior Zabget to prise them apart, things only got worse once we'd fractured the force-field like outer container. 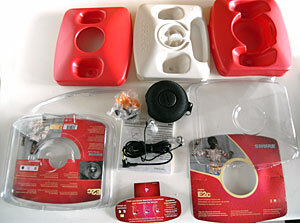 Despite the headphones already coming with their own hard storage case, no less than three, full-sized separate layers of plastic accompanied the outer shell, making this one of the most extravagantly packaged items we'd seen for a long time. Very poor show, Shure. Once we'd cleared our desk of the mountain of plastic, we were left with a little plastic bag stuffed full of coloured bits of plastic, making up three pairs (small, medium, large) of disposable foam sleeves and three pairs (small, medium, large) of flex sleeves. With the phones now primed and ready to be lobbed into our lug'oles, we were ready to settle in for a good listening session. Except, try as we might we couldn't get comfortable with Shure's unusual 'over the ear and down' cabling, which managed to turn the simple task of putting in a pair of headphones into something of a fiddle-a-thon. Once we'd finally got the headphones in a remotely comfy position and secured them deep into our ear canal, we immediately noticed that they were certainly delivering on the promise of sound isolation, with the background noise dropping dramatically. We were really looking to replace our mobile headphones (we do a lot of listening on the move), but plugging the 'phones into our Palm Treo phone was hugely disappointing. Where was the bass? The oomph? The punch? Sure, the high end response was crisp and clear and the detail impressive, but we were expecting to hear the Hammersmith Odeon, not the Village Hall. Stepping up to a Pure DMX-50 compact hi-fi brought little improvement, and it was only when we plugged the E2cs into a high end Audiolab amplifier being fed by a Rega Planar 3 turntable did we begin to see much improvement - and even then the sound was distinctly short in the bass department. Stepping back up to our favourite Grado SR60 headphones was a revelation, with a rich, full blooded sound revealing the E2cs serious shortcomings. From the near-criminal over-packaging to the fiddly set up procedure, uncomfortable fit and unsatisfying sound, these headphones proved to be a huge disappointment. Although the build quality can't be knocked with Shure's thick, high quality cabling and gold-plated connectors impressing, the sound quality falls far short of what we expect at this price (£60, with Internet deals as low as £25). And if further proof was needed of just how little these phones impressed, we went straight back to using the cheap headphones that came bundled with our phone when we left the office. 'Nuff said.